Sir Robert Askin was the longest-serving premier of New South Wales in the twentieth century… as long as you don’t count little Bobby Carr, who served eight months longer, but whose term unfortunately stretched into the twenty-first century. It will not be news to many that such petty distinctions actually matter to the ruling class. 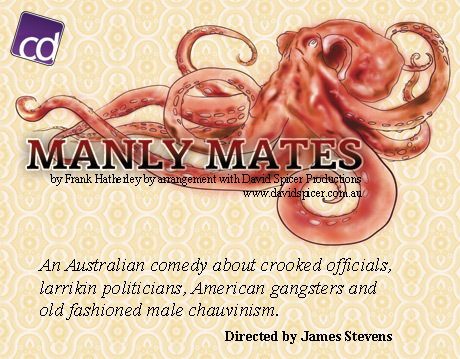 It certainly wasn’t to me; which is why, when Frank Hatherley’s play Manly Mates landed on my desk, I was keen to see it produced in Canberra. A fictitious story based on posthumous accusations levelled at Askin, Hatherley’s play plonks the jovial premier into a hotbed of gambling, womanising and crime (sometimes consecutive, other times concurrent). Joined by stoners, journalists, cops and shonky American poker machine salesmen, the scene in the private Octopus Room at the Manly Hotel is all too reminiscent of more recent rumblings of the political machinery behind closed doors in both New South Welsh and federal politics. For this production, which later came to be declared the last of Canberra Dramatics’ productions, I handed the reins to James Stevens, who has done a great job with an unwieldy script and a large cast on Tuggeranong’s small stage. The show rolls along from one laugh to the next, and on opening night, despite a slow start, they developed a full head of steam for the hilarious finale. It is great to see Michael Miller, who has performed in many of Canberra Dramatics’ shows, reprise the role of Askin in the company’s final production; he has a swagger befitting any crooked premier, and is ably supported by Rebecca Nicholson, another veteran of Canberra Dramatics’ productions, as the enthusiastic Pat. Don Wilkinson also returned for this production, as did Robbie Matthews, and these friends were joined by a number of performers who had not performed with Canberra Dramatics before, most notably among them Margie Sainsbury who landed the enviable role of Lady Molly Askin, and lends her an air of forced grace. Although I haven’t had a lot to do with this last production, it has been a pleasure to see some of the journey this cast and crew have taken. They struck me from the beginning as a very cohesive group, and I am especially glad that James Stevens took on the task of directing them. Cerri Davis, who has worked in a number of different capacities with Canberra Dramatics over the years, also did a fine job in her first role as Production Manager. In all, it was a great pleasure to see this hilarious play staged in Canberra, and it is a great finale to five years of productions.